The National Basketball Association (NBA) sent a loud, resounding message to people involved in the league and to the world at large that racist, ignorant views have no place in professional basketball in North America. The decision by NBA to ban the owner of Los Angeles Clippers for life is worth emulating by other sport associations worldwide. On Friday 25 April 2014 a celebrity news website, TMZ, published an audio recording in which Donald Sterling, owner of Los Angeles Clippers, criticizes his [alleged] girlfriend for associating with "black people" and posting photographs of herself with black friends on Instagram. He urged his girlfriend not to bring her black friends to his basketball games. The audio recording, which sparked widespread outrage and condemnation, culminated in a no-nonsense response by NBA commissioner Adam Silver. Four days after the audio recording surfaced, the NBA banned Donald Sterling from the basketball association for life. The impressive sanction didn't stop there. 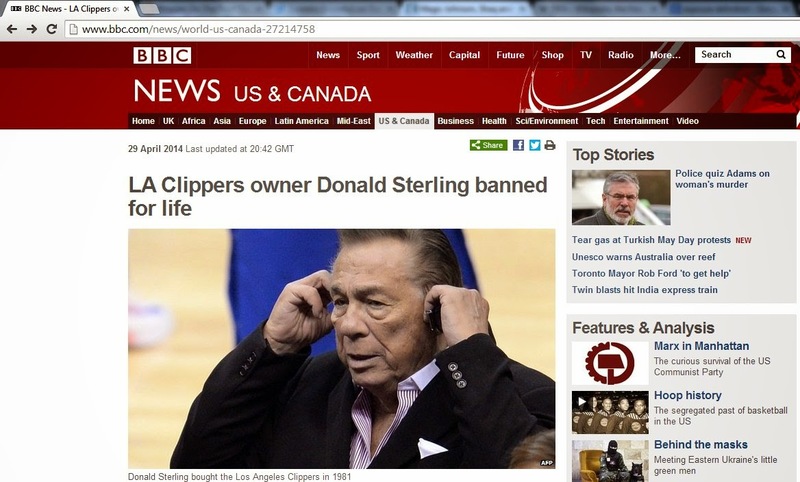 The NBA also fined Donald Sterling $2.5 million, which according to the BBC is the maximum fine allowed by the league. Personally, I wholeheartedly welcome the decision of the NBA. By banning Donald Sterling for life and slapping him with the maximum fine allowed in the league -- the NBA showed that it does not tolerate racism. A lifetime ban means Sterling is barred from participating in team business, as well as attending NBA practices and games. Donald Sterling's rant - as revealed by the audio recording - is blatantly racist, narrow-minded and should have no place in any civilized sport. In my opinion, the NBA showed zero-tolerance against racism in this case. Other sport associations including the international federation of football associations (FIFA) -- which has a long recurrent history of racism -- as well as national sports associations should learn from the NBA. Racism is a canker-worm that destroys the fabric of society. Those who -- like Donald Sterling -- espouse and perpetrate racism should be named, shamed and isolated. According to TMZ, Donald Sterling has "a documented history of alleged racist behavior". It's a shame, in my view, that someone with such preposterous, 19th century views owns a franchise like Los Angeles Clippers. Perhaps ownership should change hands -- in the interest of the team. You can't have black people playing (working) for a white man who openly despises them. Sounds like slavery to me. Donald Sterling claims he isn't racist: really?